Dollar Cost Averaging Investment Strategy – success based on luck? This article is about the dollar cost averaging investment strategy and the influence of luck in it. To invest parts of your income into financial markets has been a profitable approach, especially in times when bond yields are low. One approach to do so is the dollar cost averaging investment strategy. DCA is as simple as it can get: At the end of every month you invest a fixed amount of money into a broad index ETF. Over time you will profit from the general bullish trend in stock markets. At least that’s the promise made by many banks to get customers to invest. As you only buy, this approach is also quite interesting when it comes to taxes. As long as you do not sell, there usually is a way to get around any form of taxation of the net capital growth of your account. The chart below shows the merits of this strategy. Starting in 2000 and investing 1000$ each month into the S&P500, your portfolio has grown to more than 420.000$. 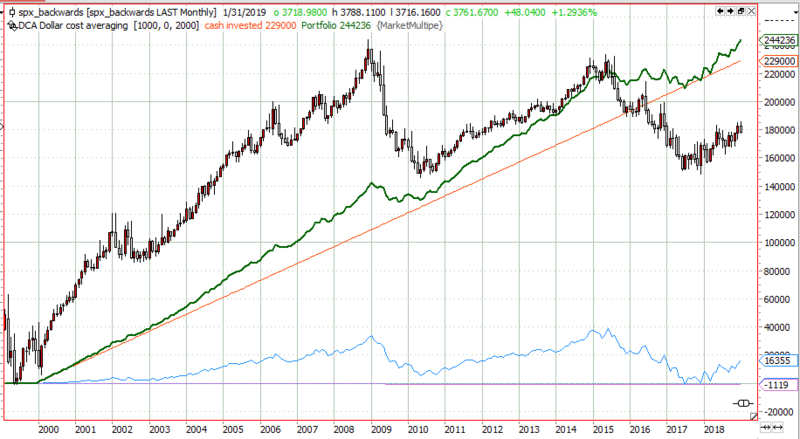 As can be seen on the chart above, investing a 1000$ per month since the year 2000 sums up to 229.000$ invested (red line). An additional 200.000$ was won due to the bullish market and the dollar cost averaging effect (blue line). 1100$ have been paid to your broker, assuming 0.5% brokerage fees per entry. In the end you made more than a 100% profit (green line). 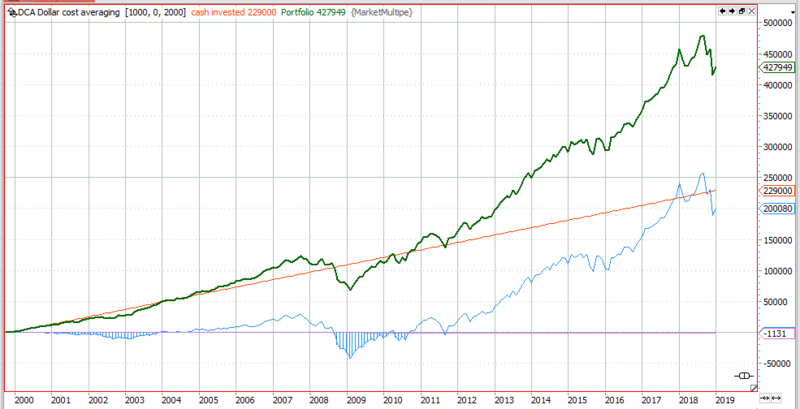 Comparing the dollar cost averaging strategy returns on the first chart to the S&P500 index itself, you see that this nice return of the strategy is mostly due to a big portion of luck. 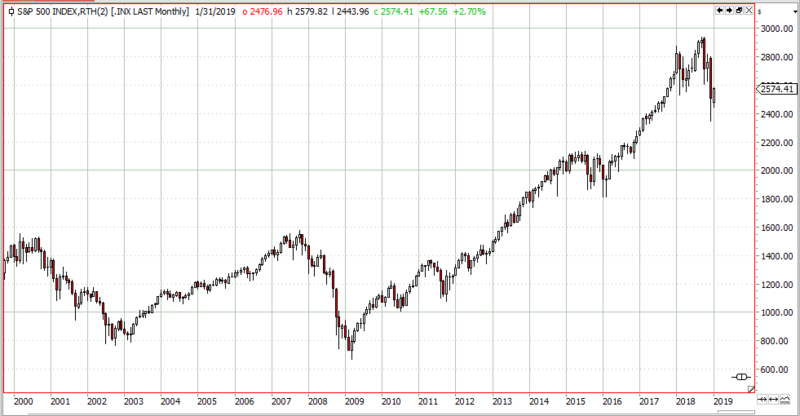 From 2000 up to 2011 the strategy made nearly no extra money as the S&P moved sideways. It basically was just a savings account. But lucky you, after 2011, when you already had 50% of the money invested, that nice 10-year money printing bull run started. This period of time brought the main positive returns of the strategy. To clarify this incredible luck I did the same strategy with a fake S&P500. Therefore I just reversed time and direction. Now S&P starts with a strong bull trend and ends with a sideway market. Everything else is the same as on the first simulation of this strategy. As you can easily see, in a market scenario like this the dollar cost averaging strategy was not as fruitful as expected. It did not double the amount of money invested as it did with the “real” S&P, but only added a little more than 16.000$ to your savings of 229.000$. You only had a little money invested at the beginning, when the trend was up, and after half of the time, there was no money to be made due to the sideway market. This killed the performance of the strategy. Dollar cost averaging – is it useful or not? Due to this big influence of luck in the outcome of the strategy it is highly questionable if this is a useful strategy for the next 20 years. In the end it all comes down to your believes about the future. If you like it please spread the word! Proudly powered by Raspberry Pi 2 | Theme: Reddle by Automattic.